A fish is playing Pokemon. A dictatorship banned a game about dictatorships. Someone is suing over 1080p resolutions (or lack thereof). Evolve is delayed. And yet the news I'm saddest about this week? Ryse is coming to PC. Ugh. Remember Twitch Plays Pokemon? The crowd-participation stream on Twitch where users typed commands into chat and collaboratively controlled the game? Well now you can watch a fish play Pokemon. 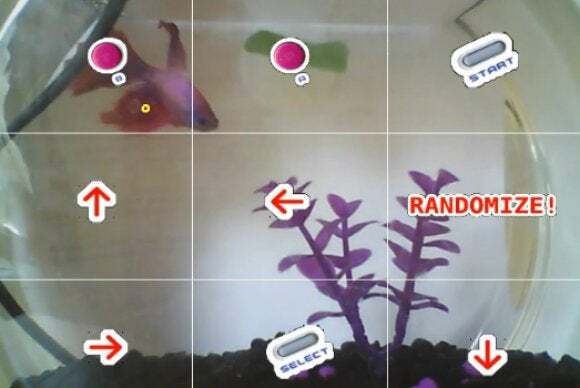 The game is played by tracking a fish as it swims around its bowl, and each section of the bowl corresponds to a different button command. The fish has made very little progress so far, and spends most of its time looking dead. The project was built in under 24 hours as part of HackNY. The Xbox One launch title Ryse isn't a great game, but now it'll be a not-great game on the PC also—its coming to your (hopefully powerful) PC sometime this fall. Crytek announced the game will support 4k resolution, and "will be a benchmark PC graphics showcase this year and probably for a long time in future." World of WarCraft hits its ten-year anniversary this November, and Blizzard is celebrating with some special promos—specifically, a 40-player version of the Molten Core raid, a Battleground in the Tarren Mill/Southshore area, and a new Molten Corgi pet. Blizzard is also announcing the release date of the latest WoW expansion Warlords of Draenor next week, on August 14—an expansion that's sorely needed, considering the game lost 800,000 subscribers between April and June. You can watch the Warlords of Draenor announcement on Thursday August 14 at 9:30 AM Pacific. Expect more details at Gamescom next week. Though they'll come minus Casey Hudson. This whole console resolution debacle has escalated to the point of hilarity now. A "Douglas Ladore" has now filed a class-action lawsuit against Sony in California, alleging that the company misled consumers by billing Killzone: Shadow Fall as 1080p. Consumers, of course, "quickly noticed and complained that Killzone's multiplayer graphics were blurry to the point of distraction." Ladore is seeking $5 million in damages, arguing that "millions of consumers have been tricked into paying full price for a video game that doesn’t deliver what is promised." You know, if everyone just played on a decent PC this wouldn't even be an issue. Our arguments these days are about whether 4K is necessary or whether 1080p is still "good enough." Thanks, GameSpot, for bringing this absolutely soul-crushing travesty of a lawsuit to my attention. Yes, Yoshi's full name is T. Yoshisaurus Munchakoopas. I can't handle any more dumb. I hope no dictatorship banned a suspiciously self-reflective video game this week. Oh no! A dictatorship banned a suspiciously self-reflective video game this week! Thailand has been under control of a military junta since late May, ever since a coup overthrew the previously civilian-led government. This week AP reports that the new military government took steps to ban Tropico 5 from sale in Thailand, citing national security. Yes, an illegitimate military government that regularly censors media took steps to ban a game where you can play as a military dictatorship and regularly censor media. And yes, the man pictured, John Cena, does look like a scary, oversized cartoon baby in real life. It's not just stylized for the game. More delays this week. Wasteland 2 falls back a few weeks to September "due to fulfillment of the physical goods and discs." Damn you, people who still use optical drives. And much more disappointing is Evolve, which will now launch in early 2015 instead of its previous October slot. Valve maybe launched the next iteration of its engine, Source 2, this week—by hiding it innocuously in a Dota 2 update. Users on Reddit spotted the changes, which include a host of files renamed things like "engine2.dll" and "vconsole2.exe" for instance. There go all the "Source 2 will launch with Half-Life 3" rumors. Twitch implemented a [MUTED] copyright detection plan this week that absolutely [MUTED] nobody is [MUTED] about. Ryse isn't the only game coming to PC—the original Resident Evil is being remade (again) for next-gen consoles and PC, releasing sometime in 2015. More weird ports— BioShock is coming to iOS. Sierra Entertainment (King's Quest) is back from the dead. Alienware has a new, thinner laptop. I also got the chance to chat with Brian Fargo about Wasteland 2, so check that out here . And, finally, if you're bored and need something silly to do this weekend? Well, you could always go pick up a copy of Wing Commander III for free from EA/Origin.